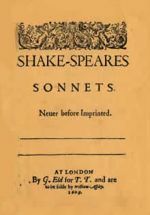 That may expreſſe my loue,or thy deare merit? Euen as when firſt I hallowed thy faire name. Where time and outward forme would ſhew it dead.